Bridges change shape, which is why they are usually built with expansion joints. At TU Wien, a technology has been developed that makes it possible to forego these joints, thus saving time and money. You can feel it straight away when you drive over a bridge quickly: the expansion joint that you rumble over at the start and end of the bridge. These joints are necessary as the bridge expands and constricts depending on the temperature, yet they are also expensive and high-maintenance. However, a type of bridge has now been developed at TU Wien that makes it possible to forego these expansion joints. The technology was patented and first used by ASFiNAG during the construction of the integral abutment bridge on the A5 North motorway. The bridge without expansion joints has now survived its first winter, with measurement results demonstrating that the new technology works perfectly. “The bridging of smaller distances with integral bridges is a popular solution – they are monolithic designs with no separate parts that could rub against each other,” explains Prof. Johann Kollegger from the Institute of Structural Engineering at TU Wien. This is not usually possible with longer bridges, because the concrete can expand or contract depending on the temperature. Kollegger explains that a bridge that is 100 metres long can differ in length by several centimetres between summer and winter; a difference that is far too great. Particularly in winter, when the concrete contracts, serious damage can occur in the asphalt roadway. This risk is lower in summer, as the material becomes more pliable at higher temperatures. The problem can be resolved using expansion joints, whereby the bridge then consists of several parts that can to some extent move freely against each other. However, these expansion joints are also a typical weak point in modern bridge constructions. They need constant maintenance, occasionally need to be replaced and account for roughly 20% of bridge maintenance costs. “And that’s not taking into account economic losses caused by diversions, traffic jams and other disruptions,” adds Kollegger. For the above reasons, TU Wien has developed an alternative. Instead of absorbing deformations at the start and end of the bridge, these deformations are distributed across a larger area. A total of 20 to 30 concrete elements are arranged one after other and connected using cables made from a special glass fibre material. The structure resembles a chain of beads threaded onto an elastic cord: if you pull on the cord, the distance between all the beads increases evenly and to the same extent. 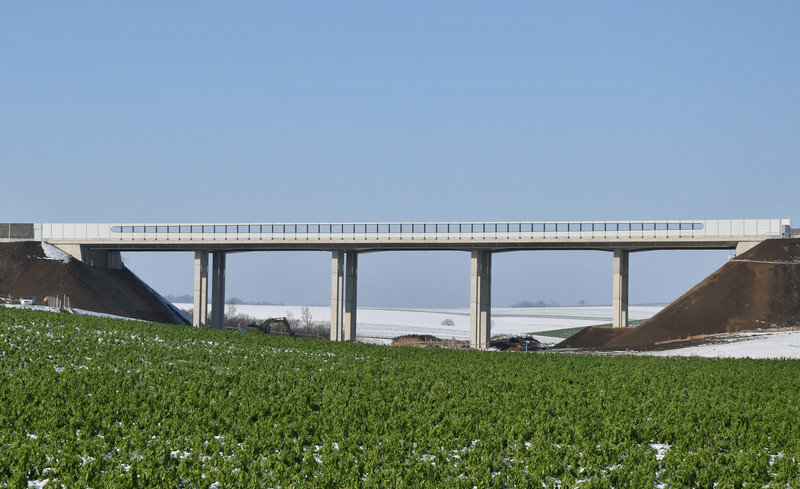 If the bridge contracts in winter, this only leaves tiny gaps between adjacent concrete elements – in the millimetre range – which pose no risk to the asphalt roadway. The jointless roadway transition structure has been patented by TU Wien with support from their “Research and Transfer Support” department. Dr. Bernhard Eichwalder, who has been a researcher in Johann Kollegger’s team for several years and received the FSV (Austrian Research Association for Roads, Railways and Transport) award for his dissertation in 2017, was also heavily involved in the development of the solution. Developing a suitable asphalt mixture to cover the concrete elements was also crucial, as it has to be flexible enough to withstand the tiny millimetre-sized movements without cracking. The team led by Prof. Ronald Blab from the Institute of Transportation at TU Wien was given responsibility for this task. ASFiNAG, Austrias motorway operator, was involved in the project right from the start and was therefore also able to implement these new findings, namely in the construction of the 112-metre-long integral abutment bridge as part of the A5 North motorway between Schrick and Poysbrunn in northern Lower Austria. As this was an initial pilot project, the decision was made to install a comprehensive monitoring program, meaning that valuable experience could be gained. Now that the coldest time of the year is over and the data has been analysed, a positive conclusion can be drawn: “Our theoretical calculations regarding the distribution of the deformations across the individual concrete elements were confirmed by the measurements,” reports Dr. Michael Kleiser, a bridge construction expert at ASFiNAG. As a result there is now nothing stopping this new technology from being used in other bridge constructions. The team hopes that the new method will soon be implemented not only in Austria, but in other states as well.